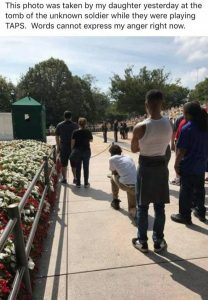 Man Kneels During Taps at Tomb of the Unknown Soldier: Anti-American Sentiment is Growing! If you think that the kneeling protests that are happening around the National Football League are anything but anti-American sentiment, think again. All you need to do is take a look around at how it is being interpreted and implemented by others around the country. A photo that has gone viral while circulating among the online military community shows a man at the Tomb of the Unknown Soldier at Arlington National Cemetery, kneeling down on one knee reportedly during the playing of taps, and is sweeping across America, outraging thousands. “Taps” is a bugle call played at dusk, during flag ceremonies, and at military funerals by the United States armed forces and is regularly played at the Tomb of the Unknown Soldier. Not standing for Taps is incredibly disrespectful. American Military News reports the picture is sparking intense outrage on social media. It is unclear exactly why the man seen in the photo is kneeling during taps while everyone else is standing, but most people online are assuming it is in protest. If that is the case, it follows in the footsteps of NFL players’ protests – close to 200 NFL players and coaches took a knee during the U.S. national anthem on Sunday. The protests were started by football player Colin Kaepernick last year to protest what he believes to be problems in America, namely police brutality and black inequality. Kaepernick was not signed by a professional football team this year. Protocol at the Tomb of the Unknown Soldier is that you stand, and many times the Soldiers who guard the Tomb will directly address people who are not standing and demand they stand. “Someone actually had the never to [take a knee] at the Tomb of the Unknown Soldier. That is the definition of absolute trash,” one Twitter user posted. “I support everyone’s right to free speech, but I feel in in the shadow of the Tomb of the Unknown Soldier it is inappropriate,” Zachary Bell tweeted. The photo is captioned: “This photo was taken by my daughter yesterday at the tomb of the unknown soldier while they were playing TAPS. Words cannot express my anger right now. “Saw a picture of someone taking a knee at the [Tomb of the Unknown Soldier] just makes me sick. I thought it wasn’t about the military,” Reese wrote on Twitter. SALUTE TRENDING: Taking a knee during the national anthem at major league sporting events has garnered national attention by way of support for some, and outrage for others. A combat veteran who was visiting Arlington National Cemetery yesterday at the Tomb Of The Unknown Soldier with his daughter snapped a photo of a man kneeling during the playing of TAPS. Has professional sports protest’s bled onto hallowed ground? Arlington National Cemetery had long been a place of reflection, honor and remembrance. We want your to know your opinion. Should Americans be able to protest anywhere they choose in a peaceful and quiet matter, or are some places completely off limits? Share your thoughts. [Tagging other pages] U.S. Infantry, Gruntworks GRUNTS 11 Bravo, U.S. Infantry Soldiers You Might Be a Veteran If. Next articleHow Can You Tell the Difference Between a Protest and a Temper Tantrum?